The Friends of the Umbrella Tree say the new demands from the Isle of Wight council put the future of the iconic tree in grave doubt. OnTheWight has the details. The campaign to save the iconic Umbrella Tree in East Cowes – which boasts high profile supporters such as Chris Packham and Clarence House – has been dealt a massive blow. According to Chris Gutteridge and Bev Webster, from Friends of the Umbrella Tree, the Isle of Wight council is insisting on £10,000,000 of Public Liability Insurance. The Friends say this has been impossible to obtain and makes the future of the tree in grave doubt. 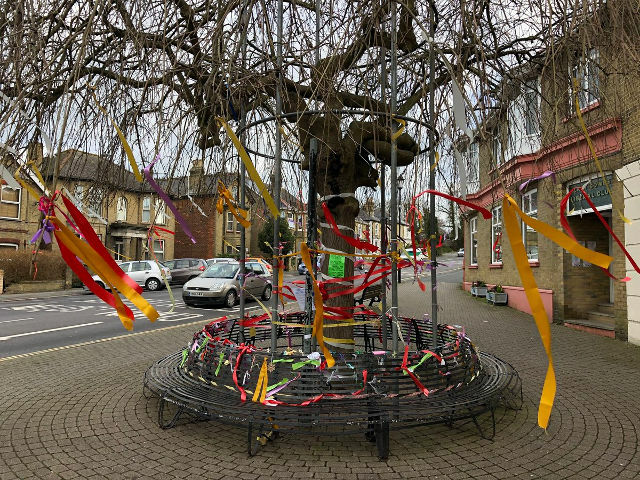 “After long negotiations between Peter Marsden and the Isle of Wight Council and the Friends of the Umbrella Tree when so many obstacles have been thrown in the way, the Council has delivered the biggest obstacle against trying to save the iconic tree in East Cowes. The Friends of the Umbrella Tree are waiting to hear if this will be allowed. They had already secured PLI of £5m last year. The Friends of the Umbrella Tree explain that one of the reports which was commissioned by East Cowes Town Council stated that although the tree has a fungus which will ultimately kill it, there is probably at least 25 years life left in it and there is no immediate danger of branches falling off. Other trees around the town have lost branches during recent storms, but the umbrella tree stands as solid as it has done for over 100 years through two world wars, flooding and hurricanes. The fungus is certainly not stopping nutrients and water feeding the crown of the tree which blooms in profusion every spring. 6 Comments on "Umbrella Tree: Isle of Wight council demand puts future in ‘grave doubt’"
Why can’t the IW Council listen to the people it represents? How difficult or expensive is it to incorporate the alleged potential danger from this iconic tree within the IW Council’s existing PLI? The latest addition to the list of well-known supporters happy to ignore the council’s scary stories about the dangers of enjoying the umbrella tree; Green MP Caroline Lucas, pictured not risking life and limb there last Thursday. I say again, treat it with Armillatox. A beautiful flowering cherry was dying of honey fungus in 1980. I treated it regularly with Armillatox, and that tree is still alive today and looking as beautiful as ever – 39 years later! I would think it highly unlikely any insurance company is going to insure a tree when two separate surveys and the council’s tree officer have found it to be dying and dangerous, especially when there are seats underneath it. As an aside, by what measure is this tree ‘iconic’? The measure of the term iconic is of course mine and reflects the description given by the IW Council to the fundamental design feature of our ill-conceived Floating Bridge to which they are happy to continue to throw millions of our taxes.